The NFL has a very serious problem! 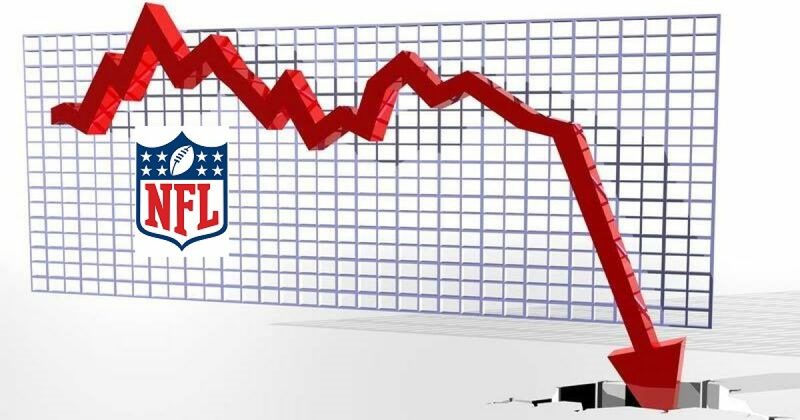 Its favorability rating, which wasn’t exactly high to begin with (30% on 9/21), is cut nearly in half (17%) in one week due to the disrespect the players have demonstrated for our flag, our country, our armed forces, and for those responsible for their paychecks – their fans. President Trump called NFL owners out on their cowardice and unwillingness to do anything about the kneeling millionaire crybabies, so naturally, the NFL and the media are blaming President Trump. All President Trump did was give a voice to a seething undercurrent of resentment across the country, evidenced in any metric you choose, from ticket sales to public burnings by fans of NFL gear and tickets to this newest brand tracking survey from Morning Consult. 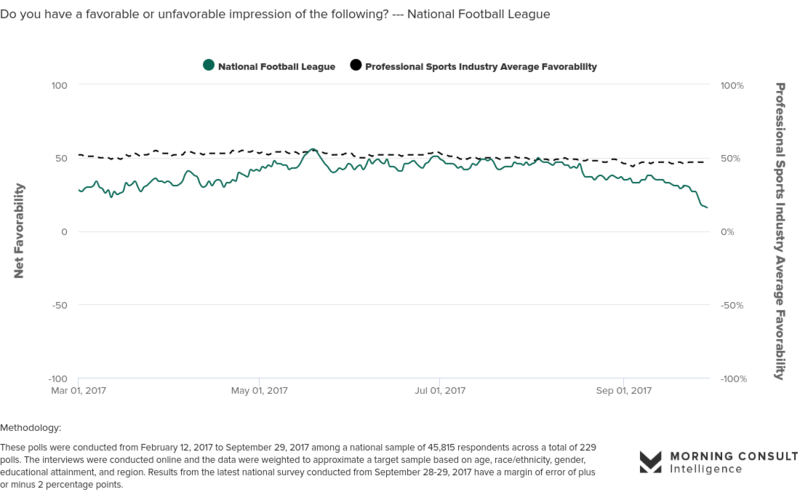 In the wake of the ongoing controversy between the NFL and President Trump, new Morning Consult brand tracking data shows that the NFL’s reputation among Americans is starting to decline, especially among Trump voters. Morning Consult conducts daily brand tracking on nearly 1000 companies and products by surveying 5000 adults in the U.S. every day. Results shown below reflect a seven day moving average and have a margin of error of +/- 3%. More details on methodology are available below. Dropping from 30 percent to only 17 percent in a week is a massive red flag for NFL management. Any smart businessman can look at those numbers and realize the league is now in full crisis mode. The longer these protests go on the worse things are going get for the NFL, unless something changes. It’s also proof that Trump supporters are more likely to side with the president than the NFL, given the massive protests came after comments he made during an Alabama rally.